"Leaving You With A FULL Wallet..... and an Empty HOUSE!!" Hello, and welcome to our profile page here on Estate Sales.org! We are a family owned & operated company that provides our Clients with the compassionate and necessary services to successfully liquidate their personal belongings. We believe that each of our Clients are unique, with specific needs, and we consider it our privilege to provide personalized services to suit your situation and location. Our goal is to provide you with the best option to liquidate your belongings, while relieving the stress that's often associated with managing the many details involved in this process. Providing service for the entire local Bay area, including Hillsborough, Pinellas, Hernando, Polk and Pasco Counties. A House FULL of ANTIQUES!!!! A House FULL of antiques!!! The estate of long-time antiques collector, Nancy Burns Counihan. Estate Sale with Vehicles, Tools, Furniture, Etc. A BIKER'S CHRISTMAS IN A QUONSET HUT: 100 Ft Long Builing Packed Full: 2 Motorcycles, Food Truck, Van, Car, Tools, Pool Table, Taxidermy, Etc! CAR-BARN / MAN-CAVE 3-DAY ESTATE SALE IN THE WOODS: Cars, Signs, Tools, Trains, Coins, Die-Cast, Etc!!!!! Man-Cave in the Woods!!!! Cars, Tools, Signs, Coins, Trains, Die-Cast, Tractors, Lawn Equipment, Etc, Etc, Etc!!!!! FULL HOUSE AND A FULL BARN: GUNS, COINS, TRAINS, TOOLS, ANTIQUES, BOOKS, LAWN EQUIP, FURNITURE, ETC! TOOLS, Tools, Tools, AND a FULL HOUSE of Immaculate, Up-To-Date & QUALITY CONTENTS!! The EXTRAVAGANT Italian Estate of Corrado Pastore: CLASSIC CARS, GUNS, COINS, JEWELRY, CHANDELIERS! 4-Day Estate Sale packed to the gills!!!!!!!! 100 YEARS ON THE LIPSEY FAMILY’S ROLLING HILLSIDE ESTATE w/ FULL BASEMENT, A FULL HOUSE, AND A FULL ATTACHED STORE!!! !!!! !MASSIVE HOARDER'S UNTOUCHED PICKER-STYLE 5-DAY ESTATE SALE ~ It's UNREAL!!! STACKS and STACKS!!! AIRBORNE RANGER'S ESTATE: Asian Antiques, Several Electronics, Tons of Tools, Top Quality Contents!!! THE HAUNTED MANSION Estate of The Late Arden Mays Merckle Jr. ANTIQUES, PAINTINGS and HALLOWEEN!!! Very Gorgeous Estate Full of High Quality Contents! DENTIST/JEWELER'S 3-DAY LAND O' LAKES ESTATE SALE!!! PACKED LAKEFRONT HOUSE!!! 3-DAY ESTATE SALE: PONTOON BOAT, APPLIANCES, FINE JEWELRY, TOOLS, JOHN DEERE RIDING MOWER, ETC!!! 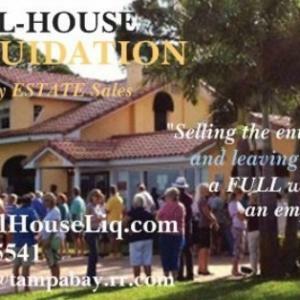 NEW YEAR'S ESTATE SALE in HOLIDAY, FL w/ FINE JEWELRY, GOLD, SILVER, ANTIQUES, PAINTINGS, QUALITY FURNISHINGS, ETC!!! A FULL HOUSE, PLUS A DETACHED WORKSHOP FULL of TOOLS, TOOLS, & More TOOLS!!! TIME CAPSULE/SHIPPING CONTAINERS" Our MOST MASSIVE Estate Sale in 7 Years!!! ABSOLUTELY Breath-Taking!!! "HIDDEN ASIAN GEM" Packed 4-DAY ESTATE SALE!!! Chinese Antiquities, Jade, Bronze, Opium Bed, Hand-Carved Teak LR Set, Etc!!! This company has posted a total of 105 estate sales. Only the most recent 50 sales are shown.